We have already seen the derivation of continuity equation, Bernoulli’s equation, momentum equation, velocity of sound in an isothermal process, velocity of sound in an adiabatic process and also the basic fundamentals of stagnation properties i.e. stagnation pressure,stagnation temperature and stagnation density for compressible fluid flow in our previous posts. Now we will start here the basics and derivation of expression of force exerted by jet on stationary vertical plate with the help of this post. Let us first brief here the basic concept of impact of jets and after that we will derive the expression of force exerted by jet on stationary vertical plate. 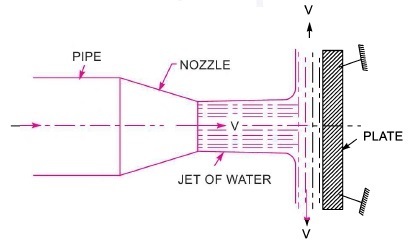 Let us consider a jet of water, which is coming from the outlet of nozzle fitted at the pipe, strikes a flat vertical flat plate as displayed here in following figure. Liquid jet will move along the vertical plate after striking the plate. As we can see from the figure, vertical plate is located at right angle to the direction of liquid jet and hence liquid jet will be deflected at right angle i.e. 900 after striking the vertical plate. The component of velocity of liquid jet, in the direction of jet, after striking will be zero. Force exerted by liquid jet on the plate in the direction of jet will be determined by using the concept of impulse momentum equation. Above equation, derived here, provides the force exerted by the liquid jet on the plate in the direction of jet. Now we will discuss the force exerted by the liquid jet on the stationary inclined flat plate in our next post.